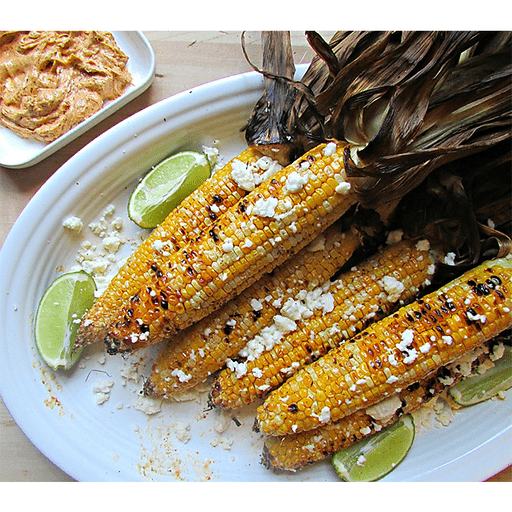 Full of smoky, tangy and buttery goodness, this Grilled Sweet Corn with Chili Lime Butter is the perfect pairing for any warm-weather meal. 1. Heat the grill to medium-high heat, about 375°F. 1. In the meantime, prepare the butter. Mix softened butter with lime juice, chili powder and cayenne pepper. Set aside. 1. Pull back husks from ears of corn, so the kernels are exposed. Place ears on hot grill, and cook for about 10 minutes, rotating so each side is evenly cooked. 1. Remove ears of corn from the grill and place on a platter. Brush butter on each ear. 1. Sprinkle with Queso fresco cheese and serve warm. Calories 210, Total Fat 8g(Saturated 4g, Trans 0g), Cholesterol 20mg, Sodium 100mg, Total Carbohydrate 34g (Dietary Fiber 4g, Sugars 5g), Protein 6g, Vitamin A 15%, Vitamin C 20%, Calcium 2%, Iron 6% *Nutritional values are an approximation. Actual nutritional values may vary due to preparation techniques, variations related to suppliers, regional and seasonal differences, or rounding.